Our shoe bench features a shelf that is 5 1/2" off the floor; higher than our boot bench shelf; that way you have room to store shoes on and under the shelf. Need storage too? Check out our combination storage/shoe bench. 17 3/4"H x 11"D. Length is by the inch from 26" to 60". Our cherry shoe benches are finished with a natural oil and clear satin finish. 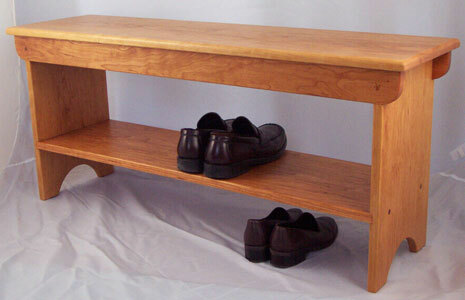 Our hard maple shoe benches are finished only with a clear satin finish. Our painted benches are built from Poplar in your choice of 56 Milk paint colors. Our red oak benches come in a clear satin finish with or without a traditional Golden Pecan stain. Our white oak shoe benches come in 9 beautiful stains. And we now offer ALL 3,645 Benjamin Moore paint colors too! NOTE: Prices shown below are full price. However, only 50% is due at time of order with the balance due when your item is ready to ship. Regular shipping is normally 10% of the finished price. But because of the large size, lengths from 26" to 36" - add $20 to regular shipping, from 37" to 46" - add $25, from 47" to 60" - add $30. If you chose white oak above, choose your stain color below, otherwise scroll down to Step 4. If you chose a painted finish above, choose your paint color below. We now offer ALL 3,645 Benjamin Moore paint colors for only $10 more! Select the Benjamin Moore Option at left and then enter the Benjamin Moore color number and color name in Step 5 below. If needed, visit the Benjamin Moore Color Gallery to help you pick out that perfect color you are looking for. Pay the $10 Benjamin Moore upcharge online. Please include your phone number below in case we can not get through to you by email. If you chose the Benjamin Moore paint option above, please also enter the Benjamin Moore color number, color name, and sheen (eggshell, satin, or semi-gloss) below. If needed, visit the Benjamin Moore Color Gallery to help you pick out that perfect color you are looking for.